The Tour Gents ventured from Hobart and Derby to rendezvous with our hosts the League at their gorgeous home track, Quamby. It was great to see friendly foes from last time Heath, Tucky and Frenchy and a couple new faces, their Captain Ade and his son Jack. Our Captain, Basil, quickly met with Ade to discuss format and teams while the rest of us had warm-ups. Jack asking Clyde for permission to destroy us! Granted. Ade showing how it’s done. The Tour’s best player of late – Tim. Leroy, fresh off the bike. Frenchy and Felix look on. Ian makes it three one putts in a row in the distance. With their greenkeeper having driven the ride-on mower into the dam and smashed up his ankle, the green speeds were a bit slow. It didn’t bother Ian, who started with three one putts and then a lip out on the 4th. Heath had five three-pointers by himself to sink Leroy and Felix. Ade was very smooth. Tim was the Par 3 specialist. It was a tough contest that went down to a putt-off on the last with players both having putts to win the hole, but both missing, leaving Ade with one more putt to win the match. It seemed like it would miss low side but it slid in for the win. Cravo didn’t bring it. His best shots were his provisional drives! Ade towelled him up 3&2 whilst politely blaming the course for Cravo’s crap play. Not a good start for the Tour! Four losses. Oh dear, time for a beer. Cravo and Ian made good inroads early, but Cravo put Ian in the blackberries on the Par 5 and then followed that up by smoking one into the dam. Three shots down and both teams hit cracking drives on the 8th, thanks Ian and Tucky. Both teams about 110m out for two. Ian hit some lovely practice swings and then skinnied the crap out of the actual shot. Still 3 shots down on the final tee and Tucky hit a perfect drive up the middle. Cravo took on the hedge going the green, and copped a big sledge from Jack, saying that only really good players could drive the green. Cravo did nicely but proved he wasn’t a really good player by leaving Ian a 20m chip from the side. Jack destroyed us with his third immaculate approach shot of the match, a lovely iron over the hedge to 4m. That meant Ian needed to chip us in for eagle and hope they three putted. Not quite. Cravo’s birdie putt had some heat on it, hit the middle of the flagstick and stayed out. All academic anyway, Tucky and Jack had it in the bag. Jack, hitting daggers, here on the 4th. Ian put this one down by the green on the short 7th to give the Tour some hope. But Tucky and Jack were here for two on the last, to make things too hard. The par 3’s killed Felix and Basil, with one in the dam and one in the hedge. Basil also sent Felix into the blackberries as well. Heath played great again, but Tim shot nine under his handicap to win 2up. What a display from the Tour’s hottest player! Tim says: ” played much better this round, again parring both the par 3s but adding two other pars (the par 5 6th, and par 4 9th), and a birdie (on the 7th, having learned how to play the drive/approach)”. Leroy improved again in session two, but fell short. Tim’s win saved our pants but after the first two sessions it was all mathematical : the League had a massive 7-1 lead. Howard missed his chance to take part in the shellacking, but it was great to see him come along to the bakery and then Longford to watch our tee offs. He can help beat us next time! Jack was enjoying destroying us, and was pumped to take on two Gents. He started slow, but picked it up in the back half to defeat Felix and halve Leroy. That was more than enough to officially confirm the League’s victory, soaring easily past the 7.5pts required. Cravo asking Basil if he can engage a new mind coach for the Tour, as our current one is a dud. Cravo connects sweetly with his 8 iron but still loses the hole. Cravo hit a gorgeous high fade drive 260m downhill downwind off the first, then a lovely 8iron from 150 which went about 40m past the green to bogey the hole and lose. Ade ended up winning the first three holes. Cravo fought back to all square. Ade shut the door with a great tee shot on the Par 3 9th, Cravo needing a long birdie to force Ade to make birdie. Couldn’t. Ade rattled his birdie in for a 2up win and some more applause and whiskey. Heath got off to a good start vs Basil but faded late and couldn’t match Basil’s consistency. A rare win for the Tour. The Tour’s best player Tim succumbed to fatigue in his third Matchplay of the day and got smashed 5&4 by Tucky. Yikes! Ian took care of business in his match…. 2&1 win vs Frenchy. We saw far too much of this on the day – Heath drinking whiskey to celebrate League birdies. So in the end the good guys of the League pummelled us 10.5 / 3.5. The most impressive thing about us turned out to be our embroidered Tour shirts. We feel a bit like the Internationals, always losing badly to the Americans in the President’s Cup! Thanks for a great day out and congratulations fellas of the League. Looking forward to getting towelled up again next year at Oatlands! 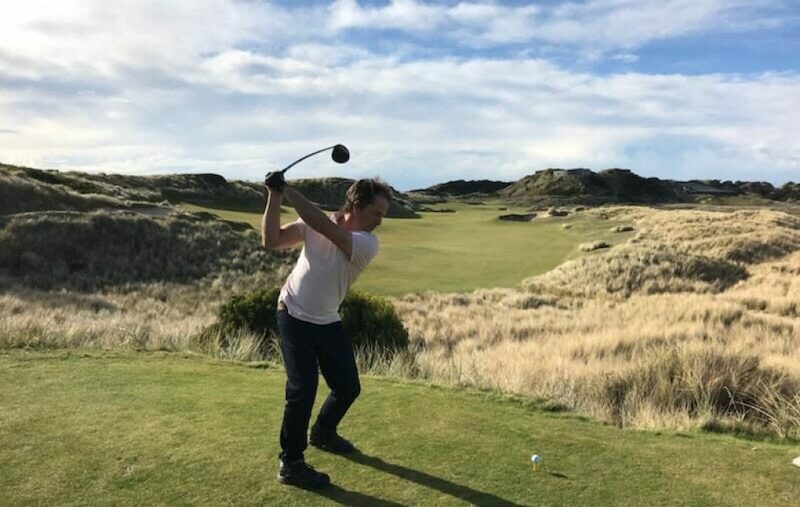 Posted on February 17, 2019 by Gentlepersons' World Golf Tour, Tasmania	This entry was posted in golf, Uncategorized and tagged #gentscup, #GentsLeague, #GWT, #quambygc, shellacking. Bookmark the permalink.